I wonder which Jesus we are hoping for this year? Your initial reaction may be, “hold on, there’s just one Jesus!” to which I would reply “you haven’t been paying attention.” Even in scripture we have no fewer than four accounts (canonical) as well as dozens (non-canonical) that offer us a wide variety of personalities and behaviors from which to pick and choose (which we do with irrational and indefensible ease as the whim suits us. Culturally, we have a plethora of Jesus models to choose from (blue-eyed, blond-haired Jesus, anyone?) and we have modernized and upgraded him to suit our tastes and preferences for centuries. 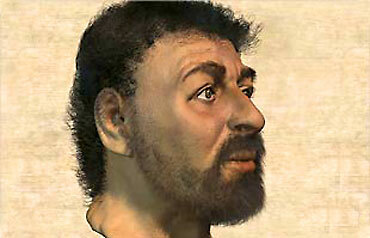 A few years ago, there was an attempt to do a reasonable reconstruction of what an average Jewish man from first century Palestine might have looked like. There was a furious response from people who refused to believe Jesus looked like this. Too ordinary. Too dark. Too non-Western/modern/acceptable. One of the reasons we love Christmas is that we get Jesus as a baby. Who doesn’t like babies, at least in the abstract? But beyond Christmas, we tend to opt for the soft, gentle Jesus who carries lambs and welcomes children. We like the handsome scholar teaching by the lake. We love the kind and compassionate healer. But what if this Christmas we get the Jesus who says, “I came to set the earth on fire, and how I wish it were already ablaze!” (Luke 12:49) or “Do not think that I have come to bring peace on earth; I have not come to bring peace, but a sword.” (Matthew 10:34) or “Men think, perhaps, that it is peace which I have come to cast upon the world. They do not know that it is dissension which I have come to cast upon the earth: fire, sword and war.” (Thomas 16). We simply don’t know what to do with such a Jesus (unless we are slightly unhinged and looking for a rationale for sadistic and violent behavior…). The earth-shaker, world-transformer — who expects US to continue this work — Jesus is not one with whom we are familiar. We want to be coddled and cuddled, not thrown into the fray and torn up. Who wants a Jesus of high expectations and incredible demands? Leave home and family? Give away all possessions? Feed the hungry, clothe the naked, house the homeless? Nobody is really looking for such a high-maintenance Jesus. Let’s keep him an infant so we can adore him with little or no cost. What I believe we need to come to terms with is that the baby about to symbolically be born again is here to demand change — radical, fundamental, and total change. For those who proclaim Jesus the Messiah, the bar is raised to incredible heights. For any and all such proclaimers, it is expected that each day we will actively, mindfully, intentionally, sacrificially and inclusively try to make the world better. It means we will put our own hopes, needs, desires, wants and hungers aside to attend to those things God holds dear. It means that Christians will spend less time worrying about what the neighbor is or is not doing with his or her naughty bits, and will be more concerned with who is being shot, beaten, starved, raped, executed, frozen, diseased, and/or violated. It means we will not spend so much time criticizing and judging others, but will put the time and energy to better use meeting people’s needs and achieving their full potential. It means we will treat one another as we want to be treated and as we would treat Jesus were he actually to be born among us today. We love the little Lord lying in a manger. What can he demand? What can he make us do? Helpless, cute, clueless and sweet — this is the Savior we adore. Low cost, no cost Jesus, come to make the world a better place for all of us. Problem is, this Jesus is a myth. Babies grow up. Kids get their own ideas and their own identities. Jesus didn’t stay sweet forever — just ask the money-changers in the temple and the Pharisees. I wonder how many people would show up at church on Christmas Eve if the light we followed was an earth set afire instead of a star in the east? If Christmas is about the hard Jesus instead of the easy Jesus, I wonder how many would attend? I have missed you. Your messages always leave me hungry for more. To learn more, to be more, to do more.